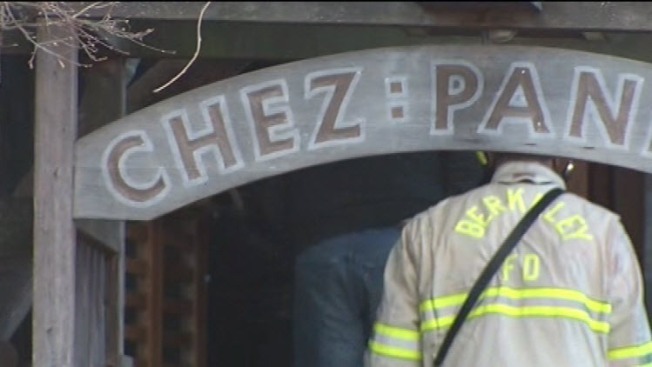 Iconic restaurant Chez Panisse, the California brainchild of renowned chef and local food guru Alice Waters, caught fire early Friday, shocking fans and foodies nationwide. The fire at the Berkeley, Calif. restaurant was reported just after 3 a.m. local time, when someone spotted flames and called 911. It likely started a couple hours before that. They don't have an immediate cause, but Berkeley Fire Department Acting Chief Avery Webb said investigators are looking at the electrical system to see if that sparked the fire, which appears as though it may have started under the porch. A sprinkler inside the building helped quell the damage, he said. Early estimates indicate the damage may be about $200,000. And despite the outside of the wooden building looking burned to the core, Webb said that inside, the "damage didn't look too bad, there's not even that much smoke damage." The main beams of the restaurant are still strong, and the main dining room, the kitchen and upstairs café were spared. Owner Alice Waters, a major force behind the local and organic food movement, said she hoped the café section of the restaurant would be open for next weekend. The fire at the beloved, trend-setting restaurant quickly drew the attention of news agencies spanning from the Los Angeles Times to the New York Times. Waters showed up on scene about 6 a.m. local time and hugged her general manager. She was obviously shocked. And she said she was glad she didn't listen to her first instincts about not putting in a downstairs sprinkler. With tears choking her words, she told a group of reporters that she was swimming in a sea of emotions. The chef and activist opened Chez Panisse in 1971, and she remembers another fire in 1982. Since then, Waters has worked beyond the restaurant to promote cooking and eating healthy, locally grown food. She often works with schools to promote good eating with young children. The menus at Chez Panisse are always changing. Her current one boasts delicacies like six Hog Island Sweetwater oysters on the half-shell with mignonette sauce ($16) in her moderately priced café. Friday's fixed-price dinner was going for $100. The main dish would have been Becker Lane Farm pork loin grilled with cumin, artichokes, rapini and white beans azafran. Waters is one of the most influential figures on the American food scene. And people from near and far flock to Chez Panisse for special occasions. Chez Panisse was recognized as the best restaurant in America by the late Gourmet magazine in 2000 and since then has won several more awards. When the restaurant will re-open is unclear, though Waters told a group of reporters that it certainly will. In fact, she said she was thinking about possibly using this opportunity to expand. "It's really important that we rebuild," she said. "I'm sure we will have the complete support of the insurance company." Contact Lisa Fernandez at 408-432-4758 or lisa.fernandez@nbcuni.com.